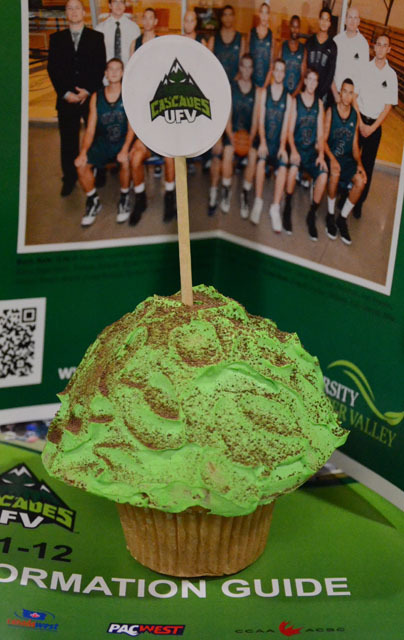 S odexo Canada and the UFV Cascades department of athletics are proud to introduce the Cascade basketball cupcake! The cupcake will be on sale at the Abbotsford Cascade Café located on the Abbotsford campus. Sodexo is honouring the UFV Cascades men’s basketball team for qualifying for the 2012 CIS Final 8 national championship tournament, in Halifax, Nova Scotia and the UFV Cascades women’s basketball team for earning a berth in the CIS Regional tournament, in Ottawa, Ontario. For the next three days the Cascade Café will be selling the beautiful “green and black” cupcake. The café is open 8 am-7pm Wed-Thurs, and 8 am-2 pm on Friday. The cost of a Cascade Basketball Cupcake will be $1.25 with 25 cents of the proceeds going towards the Feeding our Future program — a charity Sodexo Canada is involved with in Abbotsford and the Fraser Valley. The Cascades would like to thank Douglas Fowler and his staff for their dedication and support of the Cascades men’s and women’s basketball teams.